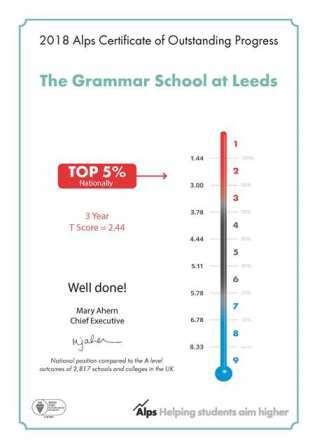 Thanks to the achievements of the class of 2018, The Grammar School at Leeds (GSAL) is in the top 5% of sixth forms nationally for adding value at A-level. The data is produced by the Advanced Level Performance System (ALPS), which analyses the A-level results of schools and colleges in the UK to produce a three-year ‘T score’, which combines quality of teaching and student outcomes. ALPS has awarded its Certificate of Outstanding Progress to GSAL in recognition of the school’s standing nationally. In 2017 the ALPS T score placed GSAL in the top 10% of schools nationally for A-level performance. 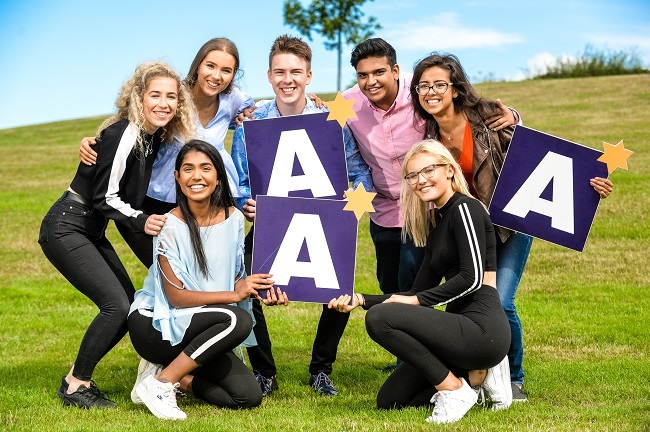 In 2018 A-level examinations, 75% of all A-level grades at GSAL were at A* to B, above the average for independent schools* of 72% and the national average of 53%. This strong academic performance led to the overwhelming majority of our students securing their first choice of destination after leaving GSAL. The sixth form curriculum at GSAL offers students a choice of 26 A-level subjects and the opportunity to complete the Extended Project Qualification. Our dedicated and experienced higher education and careers guidance team provide bespoke guidance and support for every student to help them realise their aspirations.